Sometimes it is impossible to hide in the dark. If only because there is no dark. The bright lights of industrial buildings shine down when the Sun goes down. In feudal Japan, there were no electric lights. So naturally, ninjas wore black to accomplish their ninja-y deeds. They could hide in the shadows—because there WERE shadows. Your son has expressed an interest in becoming a ninja. It’s not really surprising, every kid goes through this phase. Some last a little longer (like us, we have ninja competitions in the warehouse), and some fade with time. But your son, he’s more like us. Just last week he told you he needs to start his ninja training because that way he can save you if you ever get abducted by ninjas. But, you know that before any self-respecting ninja can start his training he must have the proper attire. He needs to look the part so all the other ninjas take him seriously. 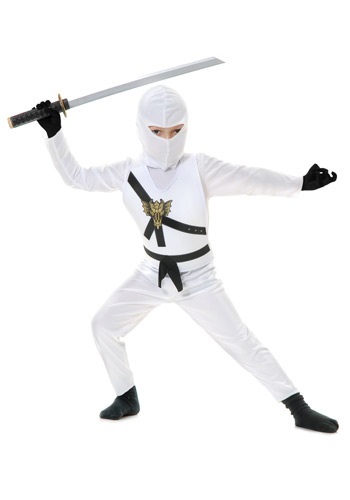 That’s why this White Child Ninja Costume is perfect for him. Don't forget to grab him some throwing stars, and maybe a sai to complete the look. With all this he will be able to train to become the most stealthy ninja in the history of ninjas—the kind that can sneak up on a person in broad daylight, thanks to his white outfit, and superb sneaking skills. Just make sure he doesn’t end up trying to sneak for snacks when you aren’t looking!